Number three son Paul and his wife Kate who also happens to be my good friend, decided it was time to get another dog after their last one died, a great, sweet-natured dinosaur of a beast, a placid Bull Mastiff named Brody. Kate, who is a card-carrying dog lover, wanted to replace Brody with something larger, droolier and hairier, which was a little hard to imagine because dear old Brody filled their house, doorways and pathways to the max. He was an unending obstacle course challenge; trying to step over slumbering Brody was like attempting to scramble over a fallen Sequoia. Time for Grannie Me to spring into action, asked for or not. Time to start thinking small. One day in idle conversation Kate happened to mention liking the looks of Boston Terriers, called “Boston Bulldogs” when I was a kid. That was all I needed to hear. I admit to shifting into high gear and got overly excited at which I am most good. I began raving about the breed, to convince Kate that having a small dog has its advantages; for example, they have a far more difficult time knocking over garbage pails, stealing the Christmas roasted goose or flattening the pizza delivery guy. I have always loved “Bostons” and in fact an old friend who owns one rated the breed from one to ten as “15.” They really are terrific dogs. Furthermore, my mother, a woman I never actually met due to her demise at my birth, owned one. I have a photo of her in a middy blouse, black bloomers, black stockings with a huge white ribbon pinned into her long curly brown hair playing with her Boston probably around 1916, when they started to become popular. Accepted by the esteemed AKC the males were called “The American Gentlemen” because of their tuxedoed appearance. 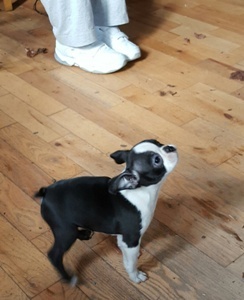 My mother was about 12 in that photo, so I decided if Kate got a Boston it only stands to reason that it would be a very distant cousin to my mother’s pet, about a million times removed. It could happen! Hey, with that kind of pressure poor Kate had to cave and focus on a little Boston instead of a Newfoundland, St. Bernard, or Great Dane. She is a good daughter-in-law and listens to me. And so, we went on a huge search. Bostons are not easy dogs to find, but Kate did. A litter born in Skowhegan. She got in touch with the owner, got in the car with her family and went to see the pups. 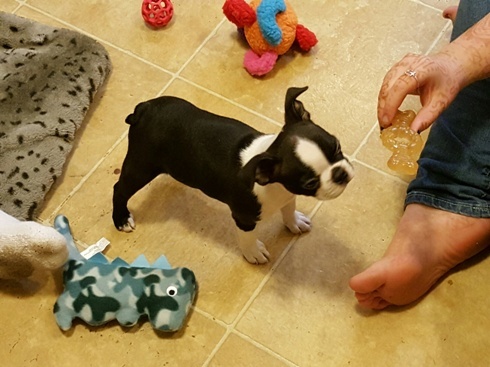 There in a gaggle of fat, beautiful Boston Terriers babies lay the runt, unspoken-for. Instantly smitten, Kate lost her heart. She’d never owned a small dog and never a female, but immediately took ownership. We all anxiously awaited the day when Stella could be adopted into our family. It came on November 11th and Kate, granddaughter Hannah and I drove to Skowhegan, which was a surreal experience in and of itself, and we entered Stella’s first home, a wondrous art gallery/workshop occupied by a magnificent horse and a big sweet Airedale, a motherly Boston and their big, kind farrier owner ---- and there was Stella, zooming about and waiting for us. Small maybe, but completely self-aware and beyond adorable. Stella has not had one instant of anxiety or adjustment from being taken from her first home and brought into Paul and Kate’s. She instantly wriggled her way into our lives, all but trains herself, has bonded instantly with our son’s family, captures the hearts of everyone who crosses her path, and I get to play with her until she gets cross and then hand her back to her real owners. Perfect! Like having grandchildren. Yeah I’m gushing. 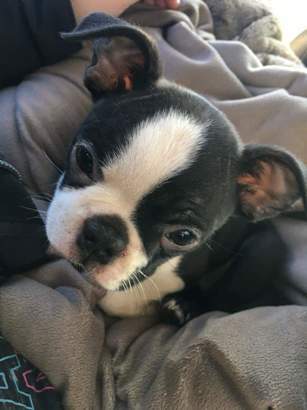 Isn’t every puppy adorable? Of course. Isn’t every new dog-family member unique and perfect? Of course. Dogs rock, as most of us know. They are forgiving, loving, so willing-to- please creatures, underappreciated by many. Not us. This little Tuxedo Tornado is already deeply embedded in our lives and hearts. Feisty, crazy, adorable, smart, bossy, exhausting and utterly captivating, Stella Nova Scott Van Savage has come home to stay.